In My Creative Opinion: All my birds are back in the nest! Happy Saturday and what a happy day it is for me! As many of you know my husband's job has taken him first to the other side of Canada and then for the last four months to Wisconsin. He came home almost every three week's, except when things at work were crazy. The last time he was home was 7 weeks ago when we took our son up to university. So for the last 7 weeks my daughter and I have looked after things here. Well today my husband is coming home and picking up my son from university on his way. My husband is coming home to stay and will be working a 30 minute drive from home, hopefully for a long while. My son, Ben, has a fall reading week so he will be home for a week! So I am a happy wife and mom today because all of my birds are going to be back in the nest! 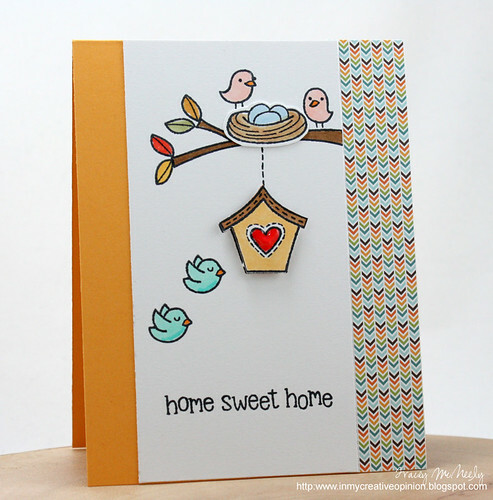 I used my very neglected Lawn Fawn Home Sweet Home set to create a card for my family. Brooklyn and I at home waiting on the arrival of the boys! A little Glossy Accents on the heart to finish it off. Your card is darling. And I'm so happy to hear that your hubby and son will be coming home. YAY for hubby coming home!! I loveeeeeeee your card! 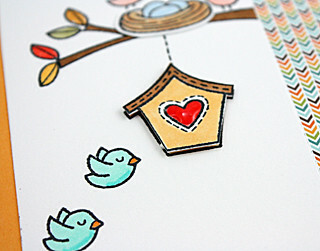 LOVING the little birds and the birdhouse!!!! yahooooooooooooooo!!! I'm sooo happy that everybody is home! What a TWEET card Tracey! Such an adorable card! so happy that everyone will be home with you! my husband also travels a lot and I know how hard that can be! Perfect card for the occasion. How wonderful that your hubby will be working so close and your son is home for so long. Enjoy this time with everyone home. Love those little birds coming home too. Tracey what WONDERFUL news that your hubby is home to stay!!! SO happy to hear this. Enjoy your visit with Ben too. This is an adorable card, one of those worth keeping. Enjoy your week together!! I am so happy for you my friend! Your card is so pretty and perfect! Hugs to you and your family! I am so happy for you that your birdies are heading home!! Isn't that the BEST feeling? I love your darling card, Tracey! The colors and patterns are perfect in every way! Enjoy your special family time! YEAH! Glad that your family will be home safe and sound with you! and this is such a cute card, Tracey! I love how the birds are colored, BTW!! Adorable card and so appropriate for a homecoming! Happy for you that your whole family will be together again! Well, I think this is my very favorite card of yours. Partly because it is sweet in every way, partly because of what it is celebrating. Super news for you, and congratulations on having all your birds back in the nest, finally. YAY! I'm so happy for you all - enjoy! FABULOUS news Tracey & a gorgeous card to celebrate too!!! This is about the sweetest card ever made! So sentimental too and I am so happy that your sweet family will all be back together! Wishing you a fabulous time. I love your card! It is just the sweetest thing! I am also happy that your Husband and son are back home. Yay for happy news! Yay Tracey! Savor every minute of your family time. Such a pretty card to mark the occasion. Your card is pure cuteness! And it's so perfect to celebrate the homecoming of your flyaway family. So happy to hear your hubby with be home. And enjoy your time with Ben. I'm so happy for you that you get a chance to be with everybody!! And I love the card that came out of it! Happy indeed! I am so happy for you Tracey! Wonderful news about your husband working close to home now. Your card is perfect and adorable! So happy for you to have your family back together for a whole week and your hubby home for good. Love this sweet card ~ especially how the pink birds are home, and the blue ones are on their way. Awww...sweet card...love all those birds! Such a darling card, Tracy! I'm so happy for you, Tracey! There's nothing like having all your chicks in the nest! So happy for you Tracey! This is such a sweet tribute to your happy story. Enjoy your family!